Fall – the best season. In my world, the year always begins in September, not January. Even tho’ everyone and everything is starting to hunker down in anticipation of the cool weather, there’s so much promise in the crisp air. 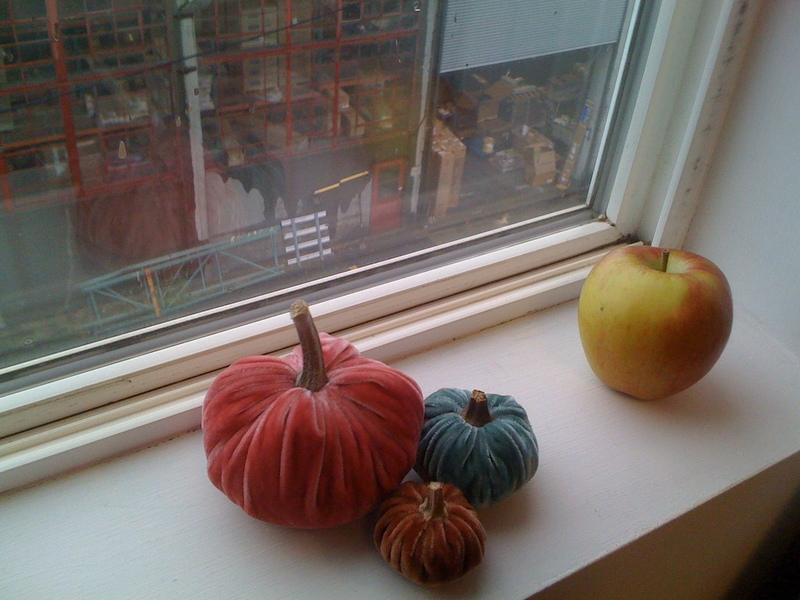 Autumn of 2008 heralded my move from our house to a workspace in the industrial section of Ballard. Adjoining 4th floor rooms with the best views I’ve ever had in my 20+ years in Seattle and all of my art supplies, books and miscellaneous stuff finally corralled in one space. Four years have flown by, several thousand invites been created and it’s time to move on . . . to a shared studio at BallardWorks with my new friend, Leah. We’re almost settled in . . . this weekend’s studio sale has been quite successful and I have just a few more boxes to move. The studio overlooks a plumbing supply building and wide window sills gave me the opportunity to display favorite treasures like these velvet pumpkins. 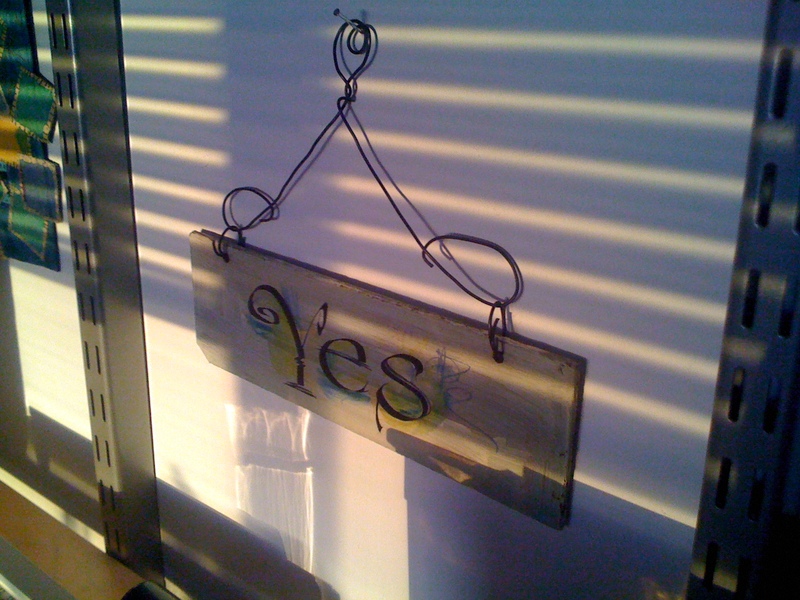 Late afternoon sun necessitated the use of blinds – especially on hot summer days. I love the patterns they create on the walls. The calligraphy sign is by artist Lisa Engelbrecht . 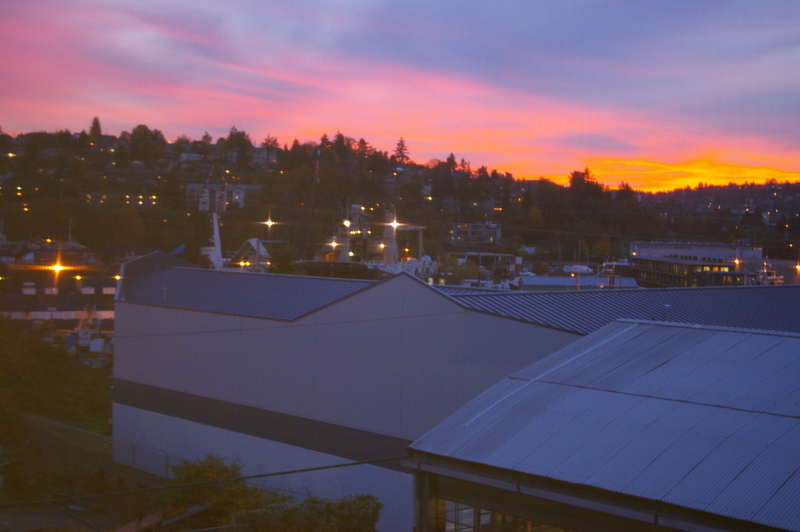 I will miss this sunset view but am excited to be moving on. Once again September is all about a new beginning.